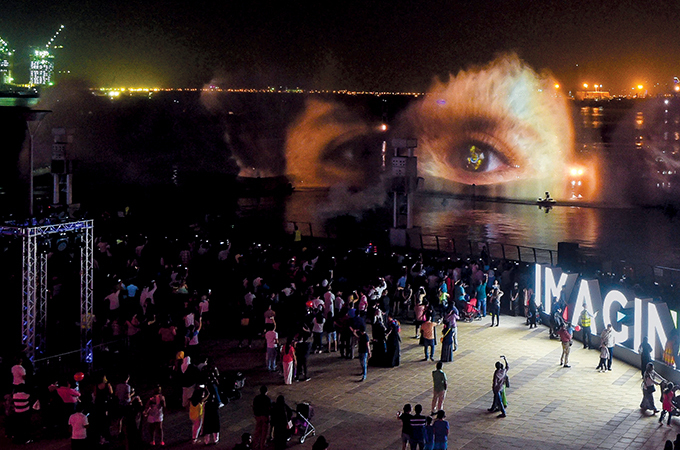 It was officially confirmed last month by Guinness World Records that the InterContinental Dubai Festival City is hosting the world’s largest permanent projection mapping, as part of the brand-new and multi-sensory Imagine show, ‘A Child’s Dream’. The accolade was awarded to James Koratzopoulos, regional general manager, IHG Dubai & area general manager InterContinental Hotels Dubai Festival City; Steven Cleaver, director of shopping centres Dubai, Al-Futtaim Group Real Estate; and Hiroki Soejima, managing director, and Yasuo Yamasaki, director of Panasonic marketing Middle East and Africa, by a representative from the Guinness World Records. The projection on the hotel is five times bigger than the world’s largest Imax screen and is the world’s largest permanent projection surface. The show also contains Panasonic HD video projectors creating over 1.4m lumens of light, six giant aqua screens creating majestic liquid walls spanning over 1,271 sq m, 30 illuminated fountains up to 50 metres in height, and nine high-powered laser systems 248 million milli-watts of laser energy. The new Imagine story, ‘A Child’s Dream’, is all about a little boy’s dreams. It is a magical journey through the child's imagination via airplanes, mystical whales, treehouses and dancing robots coming to life in a spectrum of colours. This is the second world record attained by the Imagine show, the first being the largest water screen projection in the world at its launch in December.